Cameroon qualified for the 2010 World Cup Finals on 14th November, 2009. Cameroon in the World Cup Finals, World Cup Preparations, World Cup Reports, World Cup Squad. Cameroon make their 6th appearance at the World Cup Finals. Quarter-finals - against England - Italia 1990. Cameroon prepares for the 2010 World Cup Finals in South Africa. Tue, 25th May: Georgia vs Cameroon (0:0) - Tbilisi, Georgia. Sat, 29th May: Slovakia vs Cameroon (1:1) - Klagenfurt, Austria. Enoh Eyong scored for Cameroon. Tue, 1st June: Portugal vs Cameroon (3:1) - Covilha, Portugal. Sat, 5th June: Serbia vs Cameroon (4:3) - Belgrade, Serbia. Oyster Box - Cameroon's World Cup Hotel. 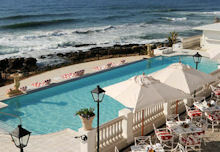 Hotels in Umhlanga Rocks - World Cup Hotels. Samuel Eto'o, Achille Emana and Alex Song. Find out more about Cameroon @ Travel Notes.